Whilst shopping online, whether I am looking to buy a gift for a loved one or to treat myself, I love finding independent companies that sell beautiful stationary, homeware and prints. When the Old English Company, who are known for their stunning hand-lettered products, kindly asked me if I would like to pick some of their products to review, I didn't hesitate to accept. As you are probably aware, I am an avid reader, from Young Adult fiction to Shakespeare plays. Once I had spotted my favourite Shakespeare quote as a print on the Old English Company website, I knew it was the perfect one for me. This print is very simple, which is what makes it so beautiful - it looks lovely in my dining room. Any of the literary prints on the website would make a perfect gift for a book lover. However, there aren't just literary prints that you can order: There are a variety to choose from such as inspirational quotes or even a unique map of London, shaped through hand-lettered names of places. Click here to view other art prints. The different lettering styles on this mug are gorgeous and once again, the simple design is really effective. I also love the inspirational quote - it's perfect for Monday mornings! Click here to view other mugs. As a student, this planner meets all of the criteria that I look for. The cover is quite thick, so I imagine that the planner will still look virtually new after using it for a while. There is space to write a date at the top of the page, so you can decide whether to use your planner daily or weekly. Also, there is lots of space to write a number of tasks on particularly busy days or weeks; I love the circles at the beginning of each line, meaning that you can tick off your to-do list rather that scribbling over it. I also like that there is a section at the bottom of the page to write any extra notes. This planner is fantastic; I am saving it for when I start university in September. 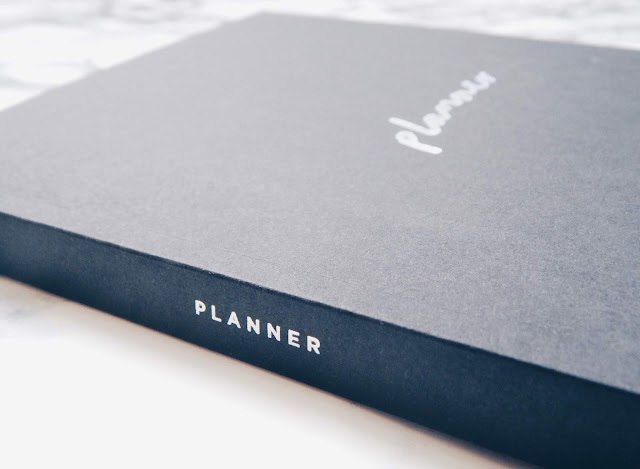 Click here to view other planners. I think that the lettering on the cover of this notebook is very pretty and I like the theme of inspirational quotes and sayings throughout the products that the Old English Company offers. Another detail on the notebook that I thought worked well was the word 'Notes' printed on the spine: It would look nice in a stack of notebooks on a shelf or a desk. Click here to view other notebooks. With a short and sweet saying, I loved the shape and lettering of this pin. Usually, I put pins on bags or jackets - I think that they look quite nice on a denim jacket. The 'Old English Company' also sells 'banner flags', so you can collect pins and display them in a room. Click here to view other enamel pins. Thank you to The Old English Company for sending me these lovely products!